The Angriest: Doctor Who: "Vincent and the Doctor"
It is 5 June 2010, and time for another episode of Doctor Who. 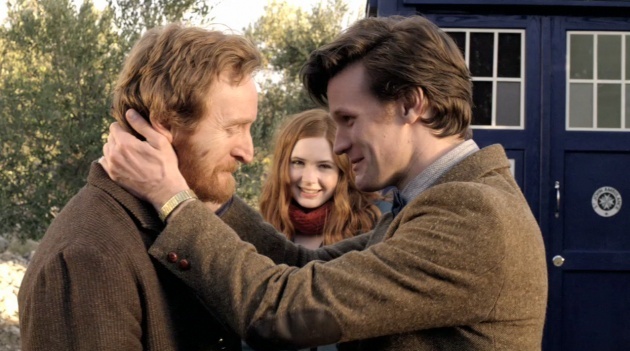 When the Doctor (Matt Smith) and Amy (Karen Gillan) spy the image of a monster hiding in a Van Gogh painting, they travel back in time to 1890 Artes to question the man himself. They find Vincent Van Gogh (Tony Curran) living in fear of a creature that only he can see - and which is murdering the villagers each night. When Steven Moffat assumed control of Doctor Who in 2010, one of the bigger surprises was in the names of some of the writers hired to contribute to Season 5. One was Simon Nye, creator of the sitcom Men Behaving Badly, who wrote the excellent "Amy's Choice". The other was Richard Curtis, then a popular screenwriter of romantic comedy films including Four Weddings and a Funeral and Love Actually. Curtis seemed an odd choice for a science fiction drama; indeed seven years after the fact he still does. The biggest surprise, however, is just how outstanding his one script for the series is. There is a superficial story here, in which the Doctor and Amy go hunting in rural France for an invisible alien creature that's eating the locals. The concept of the Doctor meeting a historical figure is now also well-worn and arguably a little tiresome: since the revival in 2005 the Doctor has met Charles Dickens, Queen Victoria, William Shakespeare, Agatha Christie and Winston Churchill. This relatively simple story is essentially a skeleton, and it is the underlying theme that comprises the enormous appeal that the episode holds. Blunt as a sledgehammer, Curtis equates the rampaging creature with depression: both are a terrifying monster that no one else can see. One could quibble that the script is too on the nose with Vincent's mental illness, but it is important to remember that Doctor Who remains in part a drama for children. It is a phenomenal step forward to see such an important health issue get addressed with both imagination and (more importantly) respect. Tony Curran does a fantastic job of playing Vincent, and creates a hugely sympathetic portrayal of a difficult and anti-social man. The production team also excel themselves, turning a small village in Croatia into the Artes that appears in so many of the real Van Gogh's paintings. To cap off the entire Van Gogh tribute, a climactic scene sees Vincent, the Doctor and Amy lying in a field looking up at the night sky. After inviting them to see the world as he sees it, the sky bursts into swirls of colour and light: the imagery of Van Gogh's art rendered perfectly in live action. It is all so effective. The episode also features two brief appearances by Bill Nighy as a Musee d'Orsay curator. Initially it seems like a great actor has been wasted, but upon reflection it actually makes the viewer really pay attention to what he is saying. His assessment of Van Gogh's art and reputation is critical to appreciating the episode as a whole. It also helps to create the perfect ending: the Doctor and Amy take Vincent forward in time to discover what an impact his art will have on the world. He breaks down and cries - what else would any rational human being do? And then he goes back to his own time and, a few months down the track, commits suicide anyway. It is a jolting conclusion, but a perfect one too. Depression is not always something that can be fixed, and certainly not by a time-travelling madman in a box. That Curtis refuses to pull his emotional punches is what pushes "Vincent and the Doctor" from being a good episode into being a great one. This is very possibly the best episode of the season; it is certainly the best 'celebrity historical' that the new series has done. Nine good episodes out of 10 brings the quality ratio up to 90 per cent. This really is one of my favourite seasons of Doctor Who.